A & H Enterprises, Inc. (Amflow) specializes in the design and development of a wide range of products, including electronic actuators, back pressure regulators, filters and flow control valves for high and low-pressure used for chemical injection applications in the offshore oil industry. Amflow valves provide accurate, repeatable and continuous flow rate. Currently installed in chemical injection systems worldwide, they provide more reliable and precise chemical injection control, and by doing so, reduce the cost of chemicals. The patented Amflow technology provides state-of-the-art flow control using a simple mechanical design, suited for automated control where precise control at very high-pressure is required. Amflow valves are available to meet the requirements of a wide range of flows and pressures. Materials of construction include, but are not limited to, 316L SS, G5 titanium, Duplex 2205 and Super Duplex 2507 to fit specific client requirements. A & H Enterprises’ unique approach to automated chemical injection with Amflow products significantly improves precise flow control and reduces maintenance costs. With breakthrough injection valve technology, the company developed flow control valves that are completely self-regulating and feature an exceptionally high turndown ratio, providing simple and accurate flow adjustment at any pressure. They are configurable for remote application and of rugged design to withstand adverse environments. Using patented dual piston technology, Amflow valves offer an easy, precise and economical approach to flow control designed to replace traditional pump systems. This patented dual piston design features a lower piston to regulate large pressure fluctuations, and an upper floating piston to automatically self-adjust to mitigate small pressure variations. The force required to adjust the valve is determined by a set internal pressure – not an overall system pressure – allowing for minimal operating torque for flow adjustment at any pressure. The result is a significant increase in turndown ratio, no scheduled seal replacements, and a wider working range of flow control. When coupled with Amflow electronic actuators, the Amflow injection valves can be remotely controlled for automated, hands-free operation. The A2-ACM and the A3 electronic valve actuators include a manual override handle to easily convert from automated mode to manual operation for easy maintenance and troubleshooting. An additional feature of the Amflow actuators is the ability to be connected directly to an output signal any 4mA-20mA device, such as a flowmeter or pressure sensor, and to then automatically reposition the valve set point to whatever value is required without an additional input from the operator, which greatly simplifys the control system design. Amflow systems have a number of advantages when compared with traditional pump systems. 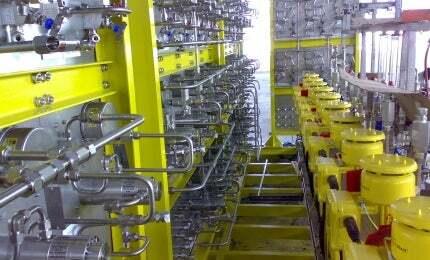 They are operated by excess inlet pressure, require less space, and reduce the total weight of the injection system. They require only one pump for multiple injection points and, yet they do not need scheduled maintenance. Of a modular and economical design, they are a closed leak-free system, important for environmental safety. After initial start-up and calibration, the system is a hands-free operation.